Good news if you're planning on buying Nikon's brilliant Z6 full-frame mirrorless camera with the aim of shooting video: Nikon has announced a dedicated Z6 Filmmaker's Kit at CES 2019. While the Z6 might not have quite the same impressive video credentials as the likes of Panasonic's Lumix GH5 or GH5S, it still has an extensive set of features, including full-frame 4K UHD video capture at 24/30fps, 8K and 4K timelapse, focus peaking, Zebra stripes, HDMI output and enhanced audio control. Announcing the kit, Jay Vannatter, Executive Vice President, Nikon Inc. said "the Nikon Z series is a powerfully capable camera system for all types of video production, and with the Z6 Filmmaker’s Kit, we’re giving videographers and content creators the gear they need to begin capturing high-quality videos with the most compelling hybrid camera on the market". So what's in the kit? There's obviously a Z6 body, plus a Nikkor Z 24-70mm f/4 S lens, Mount Adapter FTZ, Atomos Ninja V 4K HDR 5.0-inch Monitor Recorder, Rode VideoMic Pro+, MOZA Air 2 3-Axis Hand-Held Gimbal Stabilizer, an additional EN-EL15b battery and a coiled HDMI cable. Nikon is also bundling in a 12-month Vimeo Pro membership, as well as The Art of Making Music Videos, a Nikon School online course featuring Nikon Ambassador Chris Hershman. 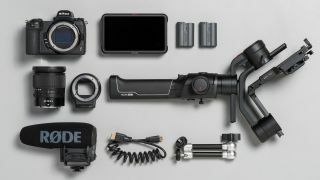 The Nikon Z6 Filmmaker’s Kit will be available in the US in late January for $3,999.95, with pricing and availability for the UK and Australia still to be confirmed.